The article below was written by my father Mr. Takeo W. F. Chen in May of 1994 and contributed to an Overseas Japanese’s Magazine in Taiwan. Since 1872, four generations of Chen’s family were born in this mining area - Jin-Gua-Shi. Both of my grandfather and father were devoted themselves to the mining works and retired from the mining company. Father got deep feeling about the mines in Jin-Gua-Shi for it’s fast growing, thriving and declining. In the article, you may find his best knowledge , loving and yearning for his hometown. Besides the original article in Japanese, the article is also translated in English and in Chinese. In memory of our father who passed away in July of 2000, I’m collecting some pictures and drawing maps to enhance the contents which is going to be published as a book soon. My sisters Sara (Ru-Ping) and Ru-Yin, younger brother Meng-Zhang are supporting to this project. It's been exactly one hundred years since the discovery of gold in Jin-Gua-Shi in 1894. I was born in Jin-Gua-Shi, and the gold mines there, one of the best in East Asia, enjoyed a glorious history. The gold brought wealth to a formerly remote and obscure region, as well as a large number of people from elsewhere seeking fortunes. Three years after the discovery, or 1896, my father was born there. It was believed that Jin -Gua-Shi, prior to the momentous year of 1894, consisted of only three households, including my family, the Chens; however, by the time I turned ten, Jin-Gua-Shi then entering a golden era, about ten thousands people were employed in its mines, arguably one of the top single-industry regions of Taiwan. A son of Jin-Gua-Shi, I began working at its mines in 1944, when I turned 14, earning 65 cents as an intern from the Japanese. Since then, I had given fifty of my best years to these mines. After ninety years of continuous excavating, the mines finally reached to its end, a complete rest. In order to earn a living, to provide for their families, those who had originally settled in Jin-Gua-Shi because of the gold began leaving the region like the low tide. Nevertheless, the mountains and streams of Jin-Gua-Shi, like the mother earth to which they belong, have remained largely unchanged. As someone fortunate to grow up in that mountainous valley, I'm often haunted to this day by memories of, and longings for, the minutiae of its past. It's been exactly one hundred years since the discovery of mines of Jin-Gua-Shi in May of 1894. In 1890, while building a railroad between Taipei and Keelung under the direction of Liu Ming-Chuan, the provincial governor of Taiwan, someone discovered gold particles in present day Ba-Du, along the riverbed of Keelung River. Nearby residents got wind of the news and began searching for the source of gold by tracing upstream the Keelung River, passing the Si-Jiao-Ting, Rui-Fang, Da-Cu-Keng and the Xiao-Jin -Gua of Jiu-Fen in 1893 . The Main Bluff of Jin-Gua-Shi, however, was not discovered until one year later; extant records did not reveal the exact time or the process of this discovery. According to documents that have survived, Jin-Gua-Shi was dominated by two cliffs, including the Main Bluff mentioned earlier. Rotund in shape, the Main Bluff measured 660 meters above sea level in height, about 80 meters higher than the present day reading. Another cliff nearby, shaped like a giant cylinder, was believed to measure one hundred meters in diameter, and also measured about hundreds of meters in height. Together they must have created a monumental effect. The cylindrical cliff looked like an elongated melon, or a cucumber, and contained a high level of gold; therefore, it became known at the time as a rocky melon made of gold, or "Golden Melon Rock," the literal translation of "Jin-Gua-Shi," a term that had since been used to refer to the entire region. Because the Southern Fukinese dialect commonly spoken in Taiwan often called pumpkins as "golden melons," the locals, apocryphally, began calling the rotund Main Bluff "Jin-Gua-Shi." My grandmother, born in 1872 , was a typical country woman. She relished in telling familiar local legends that had to do with the gold: "pull up a tuft of grass by the root, and you would end up with gold by rinsing out the dirt," or "scoop up a heaving bowl of dirt, and you would get nearly a bowl of gold by washing out the dirt." Needless to say, such sayings were exaggerated myths without scientific basis. What could not be denied, however, was the high content of gold found in the area. The local weather and geography were both conducive in purifying and condensing process of gold, resulting in a mineral rich soil of unquestionable high quality. The news of this high quality gold spread quickly, attracting people from foreign land who swarmed to this poor and remote area with their dreams of a quick fortune. The discovery of gold in Jin-Gua-Shi coincided with the war between China and Japan, and the concomitant problem of the fate of Taiwan. The mines were in a state of neglect at the hands of Ching’s Dynasty officials. As a result, the local residents used primitive and unsupervised methods to excavate the mother lode and left no exact and reliable record of production. According to the best documents, the gold production of the area in 1895 was believed to be 750 kilograms; based on the price of the gold at the time, one Chinese ounce (or 37.50 grams) of gold would yield 38 Japanese Yen. Immediately after occupying Taiwan, in accordance to the Ma-Guan Treaty of 1895, the Japanese government issued an ordinance that forbade the excavation of gold mines. During the following year, Japan further instituted a new policy that divided the mines in the northern tip of Taiwan. Namely, the region to the east of the summit of the Ji Long Mountain would be governed by Tanaka Kumi , the west by Fujita Kumi ; each group would have managerial control over its own region. The management team of Jin-Gua-Shi, the eastern half, was headed by Tanaka Chobe, who also owned the mines of Pusan in Korea. The western half was governed by Fujita Dennzaburo, a major shareholder of the Kosaka mines in Japan's Akita. Both were highly honored and decorated men during the campaign that resulted in the Konoe Shidan’s (a division of the Japanese Army ) occupation of Taiwan. The two northern mines differ in character and composition, and each developed irrespective of the other half under the reign of these two Japanese management teams. Two years later, in 1898, yet another gold mine region was identified, commonly known as the Peony Cave, managed by Kimura Kyutaroo. 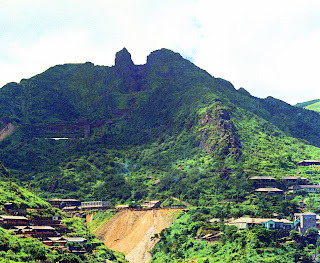 From then on, the three gold mines of Keelung developed and enjoyed a period of prosperity. Sadly, the Peony Cave, smallest of the three, peaked quickly and soon dried out. Its excavation ceased in 1913, and was bought out by Jin-Gua-Shi at 260,000 Japanese Yen. Kimura Kyutaroo continued as the owner of the Keelung Coal Mines, as well as the founder of Keelung Ship-Building Company. In order to develop the mining operations, Mr. Tanaka Chobe enlisted many highly trained specialists to Taiwan, an effort that paid off within a few years. Extent records show that around 1898, all coal miners were Japanese and numbered around 130, even higher than the 120 native laborers. By 1902, the annual yield of gold from Jin-Gua-Shi measured around 20000 Liang, or 750 kg. Around June of 1904, copper were found near the foothill of Teapot Mountain, earning Jin-Gua-Shi the reputation as the site of not only gold, but also copper, whose importance and potential were quickly identified. The copper mines was named Cho -Jin, each of the words “Cho” and “Jin” taken from the owner of the mines Tanaka Chobe and the chief engineer Komatsu Jinzaburo, two men closely associated with these copper mines. In addition to overtaking the Peony Cave, Tanaka Chobe built a processing plant in Sui Nan Dong that refined the excavated copper ore. Despite these stellar records, the prosperity did not last, especially around 1918. To revitalize the operation, he teamed up with the chief engineer at the time, Tanaka Kiyoshi, as well as the operator of the coal mines, Atomyia Shintaroo, and recorganized into the Tanaka Mining Company. Tanaka acted as the company chairman of the board; the mining operations were entrusted to Atomyia. Around that time, the mines employed about 599 Japanese, 169 Taiwanese, and 2000 common laborers. The depression that followed World War I was felt by Jin-Gua-Shi. Tanaka had to close the copper processing plant in 1923 and sold it to Japan's Kyushu Saga Refining Plant. The annual yield at the time had reached 420 kg of gold and 700 tons of copper. In 1925, Atomyia Shintaroo took over the complete control of the mines in Jin-Gua-Shi, and reorganized the operation as Jin-Gua-Shi Mining Company. In addition to Jin-Gua-Shi, he also had holdings in Taiwan Natural Gas Company, a beer brewery and other such large enterprises. At that time, the excavated ore was inspected and selected at the cave openings before shipped to the central parking area (former site of the Maintenance Facility of Taiwan Mining Company, which later became the basketball court of the Shi Yu Middle School), then transported over the Keelung Mountaion using elevated cable network to the shore of Gen-Zhi-Liao, where the mines were shipped to Saga, Japan. During the latter part of Tanaka's operation, the mines of Jin-Gua-Shi had almost been exvacated completely, and the production of gold had dropped, too. Facing such prospect, Atomyia shifted focus by developing mechanized exvacating techniques and discovering new mines. The new efforts succeeded in revitalizing the overall production. By 1930, the production of gold reached 1200 kg, whereas silver and copper yielded 4,000,000 Japanese yen. The price of gold skyrocketed from 55 in 1930 to 99.4 yen per ounze in 1933. The Hisahara Mining Corporation, founded by Mr. Hisahara Fusanosuke and later become Japan Mining Corporation, had already expanded its operation (during the 1900s) in Manuchuria, Korea, Taiwan and other colonial mining regions of Japan. After recognizing its potentials, Mr. Atomyia Shintaroo purchased the mining operation of Jin-Gua-Shi. Extant records show that Mr. Hisahara consulted with experts and negotiated the prices repeatedly before the deal became final. Purportedly, Mr. Atomyia paid 4,000,000 Japanese yen in cash, in addition to 200,000 shares of Japanese Mining Corporation's stock, each share, originally issued at 50 yen per share, worth 80 yen in market value. This purchase, 20,000,000 Japanese yen at the time, or about 7500 KG if quoted in the price of gold, would equal $2,500,000,000 NT or 10,000,000,000 yen in 1994. The Japanese employees who worked under these two entrepreneurs, Mr. Tanaka and Mr. Atomyia, eventually left for Korea and other colonial mining sites. They were replaced by 400 competitively selected new professionals from Japan. Having acquired the rights to Jin-Gua-Shi's mining operation in 1932, the Japanese Mining Corporation established the Taiwan Mining Corporation with a capital of 10,000,000 Japanese yen. The amount of capital was increased to 20,000,000 the following year, and to 30,000,000 the next year. In 1935, the Japanese built two state-of-the-art processing plants in Sui Nan Dong. During the first year of operation, the new plants processed 1,000,000 tons of rough ore, and Jin-Gua-Shi earned the reputation as the number one mining region of the Far East. In 1936 alone, Jin-Gua-Shi produced 2,500 KG of gold, 10,400 KG of silver, and 6,915 tons of copper--seemingly a bottomless cave of mineral treasures. In 1937, Japanese Mining united with its subsidiary the Taiwan Mining and intensified the operation efforts in Jin-Gua-Shi. Prudent management resulted in unprecendented growth. By 1938, the production of gold reach 2,625 KG; this figure accounted for the amount of pure gold distilled at the cyaniding processing plant only--the figure would be even higher if it were to account also the portion transported directly to Japan for processing, and the gold embedded in the copper ore. The labor size also grew; in 1939, for example, there were 9,448 employees: 747 from Japan, 6,298 from Taiwan, and 2,443 from various parts of mainland China. By 1941 the company's capital reached a whopping 240,000,000 yen. As much as Japan encouraged increased production brought about by the demands of WWII, continual war efforts inevitably shrank the size of labor pool for mining operation. To counter this situation, Japanese dispatched 800 or so British war prisoners then stationed in Singapore to Taiwan in 1942 to further the mining trade. During the following year, inmates of the Taipei Prison were also detailed to Jin-Gua-Shi to work as mining laborers to increase production. The Japan Mining strove to excavate every available corners and nooks of Jin-Gua-Shi. The depth of mining cave reached 200 meters below sea level; when adding the height of the mountain of 600 meters, the total length of the excavating shaft would be 800 meters. About 20 meters below the foot of the hills, forty or so levels of tunnels spread below like a densely spun spider web. Vertical shafts and crevices abounded. According to one estimate, the length of all tunnels reached about 800 KM, also the length of the entire island of Taiwan. Mr. Mike Kiku Ziroo, graduate of the Tokyo Imperial University, an engineer and an important architect of Jin-Gua-Shi's development as a mining region, served as the regional president of Japanese Mining and its operations in Jin-Gua-Shi from 1936 to 1941. His tenure of six years witnessed the golden era of Jin-Gua-Shi. The annual yield under his direction reached 120 tons of mineral ore, 7,000 KG of gold and 700 tons of copper. As the war efforts of the Pacific gradually drew to a close, the mining production also began to decline. The production of gold ceased in 1943; copper ceased in 1944. The end of the war therefore witnessed the closure of mining caves. At the end of WWII, Japanese ceded Taiwan back to China after fifty years of colonial rule. The Kuomintang (KMT), or the nationalist political party, quickly retreated to Taiwan from mainland China and established its hold on the island. In 1946, the Taiwan Copper and Mineral Ministry, headed by Mr. Yuan Hui-Zhuo, took over the responsibility of reorganizing Jin-Gua-Shi. Under a KMT order, the 1,300 or so Japanese employees in Jin-Gua-Shi, except for about twenty technical specialists, returned to Japan. The new management team comprised of officials from mainland China. In January of 1948, the National Resources Committees established the Taiwan Gold, Copper and Mineral Agency in order to revitalize the production of gold. In 1955, the Agency renamed itself as the Taiwan Gold and Mineral Corporation, an entity now under the jurisdiction of Taiwan's Economics Department. The production of copper resumed in 1955 also, although the yield never reached the same level as the war or pre-war years. By 1970, the employees at the mines reached 3,000, while the production level measured 750 KG in gold and 2,500 tons of copper. The post-war years continued to adopt the technical and processing methods established previously by the Japanese management. The operation went on smoothly under the supervision of Japanese technical specialists. Because Taiwan did not have state-of-the-art facilities for refining gold and silver, such a technical processing plant was built in Jin-Gua-Shi (designed by Mr. Chen Yao-Fen and located right above the Taiwan Metal Cooperation's First Dormitory, a two-story building north of the basketball court). Furthermore, a tower furnace, a reflector furnace and a copper precipitation processing plant were built in Sui-Nan-Dong in order to distill the sedimentary copper ore.
As time stabilize the post-ware uncertainties, China and Japan also renewed their political ties. Taiwan and Japan established new technical cooperative agreements: namely, the copper ore excavated from Jin-Gua-Shi would be shipped to Japan and then refined in Saga; at the same time, three Japanese advisors would come to Jin-Gua-Shi each year to share and introduce new mining technical information. This agreement lasted for about ten years from 1956 to 1965. In that same period, Jin-Gua-Shi also received aid from the United States, which contributed to the identification of new mines and new technologies (for instance, the discovery of Ji-Dong mines near the Can-Guang-Liao Mountains proved to be a valuable find). The gold content was surprisingly high, yielding in 2,000 KG between 1963 and 1965. All the same, mines are mortal like people. The rich minerals of Jin-Gua-Shi had been exvacated almost in their entirety by 1975. The production of gold and copper steadily decreased. Cave mining ceased in 1983, and open-air mining ceased in 1986. The agreement of refining copper ore of Jin-Gua-Shi in Japan came to a halt when arsenic was in trouble, causing public outcry and concern. Consequently, a reflector furnace was constructed in 1970 in Sui-Nan-Dong to distill copper. Besides refining copper from Jin-Gua-Shi, sedimentary copper was also imported from abroad for refining, resulting in an annual yield of 1,000,000 tons of copper. The Corporation also built additional facilities to produce copper by-products such as copper plate and cable and wires using pure gold to benefit the electronics industry. In 1979, Jin-Gua-Shi shifted its operation method from excavation to refining by building an electric distilling furnace with the potential of 50,000 tons of annual yield. The facility was named as Li-Le Copper Refining Plant and opened for production in 1980. Sadly, this plant experienced operation difficulties and did not solve public harm issues; the Corporation incurred embarrassing liabilities in ten billions of Taiwanese dollars. Under an order issued in 1984, the rights of the Corporation was ceded to Taiwan Power Corporation, and the mines were formally and permanently closed in 1990, thereby ending Jin-Gua-Shi's history of one hundred years of prosperity. While no precise records exists, the ninety years of operation in Jin-Gua-Shi resulted in 2,500 tons of minerals by conservative estimate, and about 120 tons of pure gold and 250 tons of pure silver and 250,000 tons of copper. Using the currency value at that time, the total yield roughly equaled to $2,500,000,000 U.S. dollars. Jin-Gua-Shi surely earned its permanent place in the history of Chinese and Japanese mining with such impressive figures. Jin-Gua-Shi, situated in the northeastern corner of Taiwan, is a mountainous region bordered along the Pacific Ocean and is about 10 KM directly east of the port of Keelung. Topographically, it occupies an uneven space anywhere between two hundred and three hundred meters above the sea level, and is surrounded by five dormant volcanoes that averaged about six hundred meters in height. These steep hills faced the Eastern Sea of Mainland China, the sweeping view separated only by the Keelung Mountain, itself also a dormant volcano. Collectively, the mountain range resembles a formidable screen from afar. In the distant past, all mines were located in remote regions. Jin-Gua-Shi, while only 45 km from Taipei, was extremely inaccessible in its early days; one must travel by foot. Transportation problems were solved gradually in stages. Those refused to go by foot could hire rickshaw. Later, light rail was built between Jin-Gua-Shi and Rui-Fang, which allowed carts to glide from place to place by hands. The progress of transportation advanced significantly in 1931, when the Yi-Lan rail line (from Kee-Lung to Yi-Lan) began operating, the Rui-Fang station of this route about 7 km from Jin-Gua-Shi, while the Peony Station about 4 km. The region was inaccessible to automobiles until 1936, or forty-two years after the discovery of mines. In that same year, to solve the problem of transporting minerals, the Japanese began laying down a twelve km long railway that followed the shore from the processing plant at Sui-Nan-Dong to the port of Kee-Lung. In 1977, this railway ceased operating and was later torn down, replaced by a freeway featuring the rugged beauty of Taiwan's northeastern seashore. Jin-Gua-Shi has the highest precipitation in Taiwan. Its annual rainfall averages about 6,500 ml, higher than the 4000 ml of Kee-Lung and the 5,000 ml of Sui-Nan-Dong, an impressive figure even in global terms. The amount of rainfall varies within Jin-Gua-Shi itself⎯the higher the elevation, the higher the precipitation. The rainfall at the mining office near the Fifth Cave, for example, averaged about 8,000 ml, and in 1974 reached a whopping 11,620 ml. The rainfall season of Jin-Gua-Shi begins in late November and lasts until the March of the following year. No one bats an eye if the monthly precipitation reaches 2,000 ml. The deluge is the result of collision between the blast of frigid air from the northeast and moist and warm air that rises from the sea level to the atmosphere. Harsh winds from the assaults the shore from the sea. The word "downpour" fails to describe adequately the heavy rain of Jin-Gua-Shi, as the rain not only comes down from above but then shoots back up due to the fierce winds. Umbrellas become useless. Besides being fierce, the rain of the region is also known for its long duration. The combination of the two makes the rainfall of Jin-Gua-Shi a claim to fame. While local residents learn to accept the continual rain that can last as many as thirty days, no one looks forward to drying laundry in such weather. Even worse is the thick moldy smell on damp blankets and quilts. In the worst of rain seasons, mold even grows on both the inside and outside of closets. The children of Jin-Gua-Shi automatically think of rain when winter comes. They are rightfully confused when they read children's books that are obviously written from a different climate: "In winter, the air becomes dry, so be extra cautious to avoid brush fire." Besides the rain, thick white fog hangs over Jin-Gua-Shi from late autumn to early spring. Visibility reduces to about five meters. You never know what you would be walking into in the midst of the fog. The source of the fog can be traced to the creek bed of Sui-Nan-Dong near the sea, which literally rises above the horizon level like clouds and eventually becomes fog that blankets over the hills. Visible to the naked eyes, the movement of fog is a spectacular sight. According to the wisdom of older residents of Jin-Gua-Shi, fog in autumn foretells rain storms, while that in spring foretells the coming of warm and sunny weather. Despite the heavy rain, Jin-Gua-Shi occasionally lapses into drought if there are no typhoons in summer. Because of its high acidic content, the aquifers of the region are not potable. In drought season, residents must rely on underwater pumped up to the surface from the creek bed near the Peony Cave. In such times, each household may access water only for four hours per day, hardly adequate for daily use. When the topic of rain comes up in conversation, residents of Jin-Gua-Shi complain about the inconveniences of its excess and absence alike, a gripe shared by all. Water sprung from the mines looks brownish and contains a high level of acid. Extremely corrosive, the cave water will stain clothing on contact and, on occasions, disintegrate the fabric. Each year, the caves drain out about 10,000,000 tons of such water, called by the locals as the Dan-Fan water. At the processing plant of the Seventh Cave, sediments of mineral from this water are gathered and distilled before releasing the liquid into the ocean. Oddly enough, the sea never dilutes the mineral content completely, staining the water near the bay of Sui-Nan-Dong. The hazy yellow shade on the ocean refuses to go away even after the closure of the mines. This part of Jin-Gua-Shi has since become known as the Yin-and-Yang Ocean, a tourist attraction of Taiwan's northeastern region. Jin-Gua-Shi lacks a flat terrain because of its steep hills. To built houses, narrow planes are cut into the hills before laying down stones for foundations. All streets are constructed of stone steps. The only exception is the neighborhood formerly occupied by Japanese residents at the central district of the mines. The beautiful streets there measure four meters wide and are reinforced by concrete and steel. The gutters on both sides measure one meter in width and depth, which act as effective troughs during heavy rains. About a dozen or so stone-stepped streets spread across s residential districts. The street that spans the north and south, from the grade school to the taxi depot, consists of 360 steps; there are 170 steps from the taxi depot to the Fifth Cave; and 410 steps from the Fifth Cave to the Japanese Shrine. Children of Jin-Gua-Shi build up endurance to trek these nine hundred or so without problems. Another residential neighborhood, Qi-Tang-Jiao, is also bordered by a stepped street that measures three meters wide. This street travels along the side of the hospital, then passes along the valley basin and into the dirt trail of the nearby mountain through the Jinza Bridge. 205 steps separate from the far end of the bridge to the Qi-Tang Temple. Well-maintained storefronts flank both sides of the busy street, which then continues all the way to Cho-Jin mines and the Sixth Cave. During the heydays of the mines, hundreds of miners can be seen carrying their lamps every morning as they go to work. The scene of the bustling crowd at that time rivals the busiest downtown spots of Taipei. Of the various residential neighborhoods, those occupied by the Japanese were called Honmachi, Kotobukicho, Eirakucho,,Sakaemachi, Hokkaido and Motoyama. Districts in Sui-Nan-Dong were called Suehirocho. Neighborhoods of locals were called Xin-Shan, Shuang-Ban-Chao, Qi-Tang-Jiao, Wu-Liao-Zai, Mao-Feng, Jin-Xi-Keng and San-Jian-Zai-An. After the WWII, all districts were redrawn. This reorganization divided Jin-Gua-Shi into six neighborhoods (Jin-Shan, Gua-Shan, Tong-Shan, Xin-Shan, Shi-Shan and San-An) and two neighborhoods of Sui-Nan-Dong (Lian-Dong and Chang-Ren). Generally speaking, people believe that the living standard of Taiwan around 1939 is about the same as that of present day Indonesia or Sri Lanka. My hometown Jin-Gua-Shi, however, enjoyed a bountiful and prosperous life in that same era. The nearby town of Jiu-Fen attained a similarly high standard of living because of its production of gold. At that time, there were as many as 37 tea houses, bars and other such entertainment spots in Jiu-Fen. Nonetheless, to the best of my recollections, I still believe that Jin-Gua-Shi surpassed Jiu-Fen in comforts of life. For instance, residents of Jin-Gua-Shi used electricity rather than the traditional chopped wood for heating. While higher in price, electricity was a cleaner and more convenient source of energy. Back then, Taiwan Electric Company’s output was about 250,000 Kw; the Japanese management at the mines contracted to have 25,000 Kw delivered to Jin-Gua-Shi. In other worlds, Jin-Gua-Shi consumed an impressive one-tenth of electric energy produced in Taiwan! Residents of Jin-Gua-Shi also had access to the latest of telecommunication. The region began using automated telephone system as early as 1934, when major cities such as Taipei still relied on operators. At that time, Jin-Gua-Shi had about two hundred residential and business telephone accounts. In short, the Japanese Mineral Company considered Jin-Gua-Shi a gold mine with vast potential for growth and earning. The region profited from well-maintained infrastructure and a comprehensive social welfare system. Necessities of life, from the essential to the recreational, were all thoughtfully planned and provided; these included movie theaters, schools, post offices, dormitories, hospitals, hotels, commissaries, swimming pools, tennis courts, stadium, martial arts club, wrestling club, archery club, Japanese Shrine, temples, crematorium and cemetery. Residents of Jin-Gua-Shi considered the Spirit of the Mountain as their guardian saint, whose annual celebration fell on July 15th of the lunar calendar. As such, both July 15th and 16th were holidays. On the eve before the holidays, miners ended their day by entering a lottery for special prizes. The lowest cash prize was two yens; the highest was five hundred yens. The value of these prizes could be deduced from the price of pork at the time, which was about a quarter-yen per one Taiwanese kilogram (about 0.6 metric kilogram). On the day of the feast, grammar school students made rickshaws for the spirit of the mountain using gold, silver and copper materials, which they paraded around the streets for a colorful show of yellow, ivory and red. Worshippers in fine clothes crowded the trail leading to the temple of the Spirit of the Mountain, their hands carrying colorful ceremonial banners and either stone or paper lanterns. In the evening, the tennis court in front of the hotel became the site of the spirit festival ceremony and a dance party that lasted until late at night. Brilliant display of firework against the dark sky brought the celebration to new highs. The Jin-Gua-Shi Grade School consisted of only seven classes that fell into two divisions: General and Advanced. A typical country school, the school had about three hundred students (editor: during the period of Japanese occupation, Jin-Gua-Shi had two grade schools; Japanese children attended the Jin-Gua-Shi Grade School and Chinese children attended the Jin-Gua-Shi Public School). When entering the auditorium of the School, the first object in sight was a group of five or six antique-grade 72 rpm record players, quite expensive at the time of purchase. Both the Jin-Gua-Shi Grade School and the Jin-Gua-Shi Public School were two-story, reinforced concrete and steel structures that had rooftop patios. Hallways outside the classroom had double-paned windows above the railings that insulated the structures from extremes of weather, a luxury rarely found in other schools in northern part of Taiwan. The Jin-Gua-Shi Grade School began as an extension of the Twin-Leaf Elementary School of Keelung, which was founded in 1895, and was one of the three oldest elementary schools of Taiwan. It just celebrated its centenary in 1994. In 1910, this extension combined with the Peony Cave Elementary School to become the Jin-Gua-Shi Grade School. Despite its small size, the school had a long and illustrious history. As stated previously, there were about 130 Japanese employed at the mines in Jin-Gua-Shi during 1900. If half of these had brought families with them from Japan, then there were probably about 50 or so Japanese children. In 1912, the Jin-Gua-Shi Grade School was an imposing western-style brick building. The Japanese Mining Company renovated the building in 1935, a successful project that led people to describe the new look as a dazzling display of azalea above an aircraft carrier. Even though sixty years had passed since the completion of the renovation project, a glimpse of the annual bloom of azalea on Jin-Gua-Shi’s hills immediately brought back the splendor of the school building. The Jin-Gua-Shi Grade School was renamed as the Jin-Gua-Shi Public School in 1941. Intended to serve Japanese children, this institution was abolished the second year following the end of the WWII. After being condemned, the school buildings served as the official conference center of the Mining District’s Public Police. Five years later, in 1950, the site became the Shi Yu Junior High School, serving only the children of employees of the mines. A significant contribution to the educational future of local students, the School boasted around one hundred or so graduates who had gone on to earn PhDs or become CEOs. Sometime later, the School was ceded from the control of the mines to become a separate public institution. It consisted of three grade level, each with eight classes. Over one thousand students in size, it continued to expand and develop, and became a renowned school in Taiwan’s northern region. The Jin-Gua-Shi Public School was an extension of the Rui-Fang Public School, and had a shorter history than the Jin-Gua-Shi Grade School. According to extant records, the first graduating class in 1924 had only one student: Mr. Huang A-Guo. He did his hometown proud when he passed the entrance examination for the Tokyo Medical School in Japan and returned to Jin-Gua-Shi to open his medical practice upon graduation. By 1931, the School had two classes; by 1935, it had three classes that were named Pine, Bamboo, and Peach Blossoms. In that same year, the school site was moved from the foothills of the Main Mountain (editor: the present-day parking lot of the Jin-Gua-Shi bus depot) down to the old mining compound. During the period of rapid expansion, the population of Jin-Gua-Shi rose sharply, and so did the number of school-age children. Additional classrooms were built to accommodate the new wave of pupils, though the student population always outpaced the expansion programs. In 1941, the school was renamed as the Eastern Jin-Gua-Shi Public School. Two years later, in addition to the existing six classes per grade level (Pine, Bamboo, Peach Blossoms, Cherry Blossoms, Peach, and Chun), one more class was added to each grade for a total of seven classes. The General Division alone had 33 classes and over two thousand students. During the twelve years from 1932 to 1943, Mr. Akasegawa Shioli served as the principal of the Jin-Gua-Shi Public School. Born in Kagoshima, Japan, Mr. Akasegawa Shioli spent countless hours to the development of the School, which grew rapidly under his prudent guidance. Known for his no-nonsense demeanor, he carried out his instruction like a shogun warrior and expected from his students proper conduct and utmost attention to academics. In addition, he was an accomplished calligrapher. During his tenure, students and teachers devoted much time on calligraphy, and many of them acquired outstanding penmanship. As the WWII came to a close and the mining operations dwindled, the Jin-Gua-Shi Grade School entered a period of decline. The school size grew again slowly under the name of Gua Shan Grade School, which grew to a respectable size of thirty or so classes by 1970s. Nevertheless, the overall population of Jin-Gua-Shi dropped significantly around 1980, and the school size dropped to only one class for each of the six grade levels. It had about one hundred or so students as of 1994. The mineral riches and the beautiful scenery of Jin-Gua-Shi are priceless God-given treasures easily taken for granted by locals. Jin-Gua-Shi earned worldwide reknown for producing the Enargite (Cu3 A5 S4), an extremely rare mineral. Even rarer was the Famatinite (Cu3 Sb S4), a mineral that could not be found anywhere in the world except Jin-Gua-Shi, although another mineral, found in greater abundance, the Lusonite (Cu3A5S4), was worth more money. These facts were known by only a handful of mineral specialists. The Famatinite crystals were discovered in the mineral bed more than one hundred meters below the sea level. The collecting of Famatinite could no longer be revived, because the tunnels inside the mining caves had all been collapsed after the mining operation ended. To see this rare mineral, one would have to track down collectors or scholars fortunate enough to have acquired them. Jin-Gua-Shi could never have provided a hospitable habitat for most foliages to thrive because of its inclement weather and rough hills that typically measured around seven hundred meters in height. Nevertheless, a few native plants managed to bloom in this adverse environment: Primitive Azalea, Red Star Azalea and Deer Lily. Primitive Azalea was usually referred to as the “Golden Plume Azalea”, a hardy evergreen shrub that usually measured below one meter in height and known also by its species name Rhdodedoron Oldhamii Maxim. A native plant of Taiwan, it had thick leaves where fine fur covered their underside. Every spring, the Golden Plume Azalea would bear bright red tubular-shaped flowers with five petals, thus earning the nickname of Ruby Hills. I believe that when Jin-Gua-Shi was still a remote, thinly populated village, and before the discovery of mines and the subsequent influx of fortune seekers, Ruby Hills must have flamed the hillside a deep crimson each spring with their blooms. Jin-Gua-Shi was indeed a quaint village full of colors and charms to be savored. An equally notable plant was what local residents referred to as the Ban-Ping-Shan Shi-Nan, which was more aptly named as Red Star Azalea or , and known by its species name Rhododendoron Hyperythrum Hayata. This shrub measured above one meter in height and was larger than the Golden Plume Azalea. They bloomed in April with light pink flowers. Unlike the Golden Plume Azalea, which grew abundantly in all the mountains of the region, Ban-Ping-Shan Shi-Nan, as its name implied, would grow only in mountains formed by aqueous rocks, like Ban-Ping -Shan, Can-Guang-Liao-Shan and San-Diao-Ling. They were not to be found in mountains formed by volcanic rocks, like Ben-Shan, Cao-Shan, Wu-Dan-Shan and Keelung Mountains. Today these rhododendron would only grow in the mountains of Jin-Gua-Shi, and attracted the attention of horticulturalists worldwide, many of whom made pilgrimage to the area to collect samples and seeds. Ban-Ping-Shan Shi-Nan could endure the heat and drought of summer, as well as the wind and rain of winter. Its roots could extend to rocky terrain where elements had already withered away the soil. This resilience allowed it to survive⎯the will to live overcoming adversities. Oddly enough, some people had attempted, without success, to grow Ban-Ping-Shan Shi-Nan in more hospitable, flat terrain, away from its natural habitat. Those who devoted their lives to the mines of Jin-Gua-Shi had to leave in recent years for the cities in order to survive. Besides upholding their hardworking ethics, they had to apply themselves with even more patience, dedication and will, or else they would share the same fate as the Ban-Ping-Shan Shi-Nan transported to a foreign soil. Several forest fires have resulted in the imminent and inevitable extinction of the Golden Plume Azalea, Ban-Ping-Shan Shi-Nan, Deer Lily, or the Japanese Wild Cherry Blossoms that were planted by the Japanese along the road that led to the Japanese Shrine. This irreparable loss of wonders of nature saddens me⎯in fact, it’s a sadness that far outweighs my sadness over the permanent closure of the mines.